Out of Brakes, available for iPhone and iPad through the Apple iTunes App Store, and also for Android through the Google Play store, is an interesting take on the racing genre, and a game that is as strangely addictive as it is refreshing to look at. The racing action takes places from an isometric viewpoint, which is something of a rarity on the App Store, especially with fixed scrolling. I think this is because it can be tricky to judge movement and speed from an isometric viewpoint, but here the developer has got the combination of speed, lateral movement and object size just right, making this an extremely fun game to play. Essentially an endless runner, you must hold left and right on the sides of the screen to make your vehicle move sideways, while your speed constantly increases as you automatically move forward. Smashing into blue walls is the only way to slow you down, while red walls will end your run instantly. There are also a few other obstacles littering the track, some of which will make you spin out. You will see the occasionally trophy on the track which must be collected in order to earn new vehicles, and you get a random new toy for every 100 trophies you hand in. I was also regularly gifted batches of trophies as I continuously played, and you also have the option of simply buying each of the cars if you so choose. 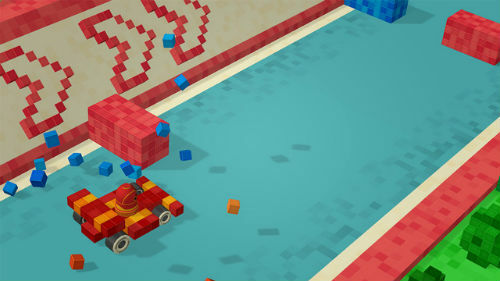 The look of the game is fantastic, with voxels making up little blocks that form your car. Crashing and watching the blocks, and your driver, spill all over the road almost makes up for messing up your run. It all moves very smoothly and has a vibrancy that really appealed to me. I also loved the little touches such as different graphics themes for some of the cars, and the fact that every vehicle has its own stats. Online leaderboards round out what is a very well put together package, but I cant help but wish for more. The game has real quality, and bags of potential and I would love to see the developer go all out and use this as the basis for a full on driving game in the future. Reduce the size of the cars, add proper courses with turns and opponents and you would have something to get very excited about, so hopefully the developer will fulfill that potential. What we do have here is a perfectly polished, superb little endless racer with a lot of character and finely tuned gameplay. I just hope this points to a more ambitious future for a clearly talented developer.